Roman artists during the time of the early empire had taken influences from the Greek and even the Republican realism and had adapted it yet again into a new style: a Roman form of idealism but with strong ties to realism. So for example they may take strong features in a face, and then add soft idealistic tones to it. The over all image in grounded in realism with idealistic over tones. This new style enriched the portraiture of the Roman officials and representations of the individual patrons. The artists of this time impressively sculpt historical events in many forms. This sculpture is a great example of the new style you see in the early empire of Rome. This is an idealization of the Ruler Augustus. The statue is 6'8" and his stance was adapted from the famous Orator seen in the Republic. There is also added mythology with the presence of Cupid at his feat. Cupid was the son of Venus who Augustus' family had supposedly descended from. Also, his breast plate is also a propaganda in its own depicting various scenes which include some Gods. As seen in the pictures this statue was originally painted. Sculptures would used vibrant paints to accent the fine details of the sculpture. This is a reproduction of what the statue orginally looked like based on ultra violet light research on the original. The artist would use color to help the spectators read the detailed images in his armor and intensify the over all presence of him. Augustus was particular about the way he was portrayed in art. He was always sculpted as a young man in portraits.He was often portrayed as giving praise to his troops or offering words of encouragement to the people. He wanted to be seen by his public as a gracious ruler who was blessed by the Gods and as a man who ruled through intelligence, reason, and persuasion. He did not want to be seen as a tyrannical power. 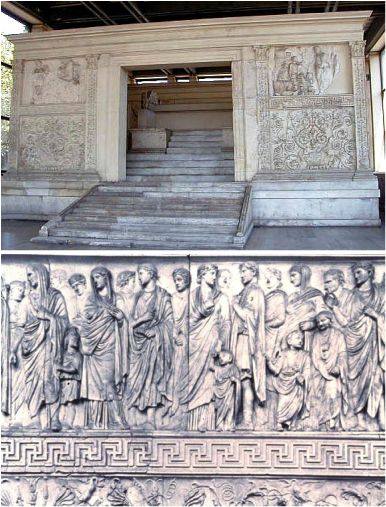 The Ara Pacis Augustae, or the Altar of Augustan Peace, was made to celebrate and remember the return of Augusts to Rome after conquering in Gaul and Hispania. It was a rectangular walled structure with an altar inside. The sculpture done all around this monument of peace shows the characteristics of Roman sculpture in the very small pointed details all around the entire altar. An interesting aspect about this piece in comparison to others would be that it depicted events that were current, and not historical. It also shows the actual people that were there. In the lower picture you see the imperial procession which included the entire family along with the children. This shows that there was a desire to place emphasis on family and potential heirs. The Gemma Augustae is an impressively extraordinary onyx cameo that shows Augustus in victory over the barbarians, and showed him as a God like fashioned emperor. This amazing piece of art is marked by incredible skill. You can see recognizable Roman portraits in Roman realism. This arch in particular is the Arch of Titus. It was erected in celebration and memory of the capture of Jerusalem by Titus who was the brother of the emperor Domitian. He ordered this to be made after obtaining the thrown in 81 C.E. It was constructed of concrete and faced with slabs of marble. The vault of the arch was decorated with the 4 horse chariot and driver which was a very typical symbol of triumph. It was also decorated with the procession and treasures that they brought back to Rome. The arch is also engraved with architectural columns supporting it, stating that the Senate and Roman people built the structure to honor Titus.